Chopping and lifting patterns are often used as corrective exercise or for overall muscle strengthening. Many fitness professionals incorporate the chop and lift as a complete upper-body workout program, while others use it to enhance global muscle pushing and pulling lifts. The movements are hard to classify because they incorporate both pushing and pulling vectors. However, there are many more functional movements occurring in a chop and lift than simply pushing and pulling, making it a valuable “go to” exercise in rehabilitation. Chopping and lifting is based on PNF patterns that are spiral and diagonal. When two hands are involved together in the same direction, crossing the midline of the body in a downward or upward movement, it is called a chop or lift; whereas in the world of PNF, independent hand exercise is simply called D1 or D2 patterning and then the direction of movement is named by flexion or extension. These are advanced movements based on patterns used in physical therapy. Building a movement-based rehabilitation program including rotational, spiral and diagonal patterning is essential in long-term core functioning of the body. The goal is to prepare your client for susceptible movements found in activities of daily living associated with a high risk of back injury (flexion and rotation). Chopping is the downward movement across the body from a high position to a low position, and lifting is the upward movement from a low position to a high position. They are essentially mirror images of each other. Each of these movements can be done in various positions (supine, tall kneeling, half kneeling, seated, standing, scissor stance) depending on the underlying stability of the individual client. Starting position is dictated by the health professional’s evaluation of static, dynamic and fundamental stability. The degree of dysfunctional stability (motor control) dictates how challenging the exercise should be in regards to positioning and resistance. Chop-and-lift patterns for fundamental stability dysfunctions typically begin in an unloaded supine position to lessen demand on the nervous system, thus increasing quality of movement. Static and dynamic stability dysfunctions warrant tall or half-kneeling patterns to engage core musculature of the hip. Stability dysfunction is an underlying causative factor in lower back pain. The lumbar spine is designed to be more stable than mobile. 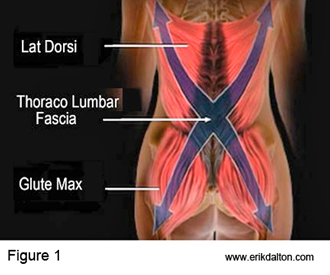 If the lower back becomes too mobile, the chances of injury from microtrauma are significantly increased. If you find squatting or forward-bending patterns to be faulty, the position of tall kneeling is used as a corrective exercise for trunk stability. Exercise in this posture will promote core static stability when the hips are in the same position. This creates a base for dynamic stability when the hips are allowed to move, but the core must remain stable. Stability work with both hips in a symmetrical stance will coordinate the basic spine stability for squatting, lifting, lunging and swinging or any activity on the similar stance base. Tall kneeling is the most favorable position because it takes away all compensations that usually occur at the foot, knee and ankle joints when hip mobility and stability are not optimum. Think of all of the compensations that occur in sports, exercise and activities of daily living when individuals do not have correct body mechanics. During squatting or bending motions, you may see a loss of a stable foot position, excessive out-turning of the feet, rolling of the ankles, inward caving of the knees, loss of hip extension and unsafe spine flexion (hypomobile hips or hypermobile lumbar spine) – all to compensate for a lack of range of motion or stability within the hips and core. By utilizing the tall-kneeling position, you take away these potential compensations, forcing the body to deal with the load and work out the problem. You also take the quad-dominant, hip-flexor-dominant individual into a position in which they cannot use anything but appropriate core stability for both the chop and lift movements. The “fallback” compensation and cheating mechanism is removed. A stacked and neutral pelvis that prevents the individual from “hanging on” their hip flexors for stability is the goal in positioning. Be vigilant in your precision of movement and do not sacrifice quality for quantity. Half-kneeling chopping and lifting is usually done when a single leg discrepancy is identified. This can be seen when an individual has a static or dynamic single-leg stance test that is both stable and mobile on one side and deficient on the other. Anytime a single leg shows limitation, the half-kneeling position or lunge on that side will show you how the core has had to compensate in many of the mobility and stability problems. You should be able to note the compensation if you compare the move to the other side. Adding the chop or lift to the position will magnify the left-to-right asymmetry in mobility and stability to help you formulate a strengthening program. The chop and lift involves basic cross-body patterns, and strength should be symmetrical. Work on the weaker side until you notice symmetry in strength and precision of movement. You should recommend only one set on the strong side and 4-5 sets on the weaker side if asymmetry is present. The best strength comes between three and six reps. Remember, this is a strength move and should be treated as loaded resistance training. When done correctly, the chop and lift will use and strengthen every muscle group in the upper body, and reinforce core stability and hip control. It complements the natural range of motion of the shoulders and helps maintain flexibility while correcting muscle imbalances and adding strength. Once each side is symmetrical in quality and quantity, then recommend three sets for each side. The chop and lift enhances solid, sustainable power posture and lower back stamina. The back will feel more stable and powerful while bending, twisting and turning. The chop-and-lift exercise combination is one of the most powerful movements in building an injury-free back program. Some form of the chop and lift should be at the core of your rehabilitation program. Clients gravitate toward the simplicity and fun of the exercise. It’s not your generic, run-of-the-mill rehab exercise – and that’s the idea. Cook G. Athletic Body in Balance. Champaign, IL: Human Kinetics, 2003. Boyle M. Functional Training for Sports. Champaign, IL: Human Kinetics, 2004. Boddicker C. “Progressing the Chop and Lift.” April 26, 2010. Prentice WE. Rehabilitation Techniques for Sports Medicine and Athletic Training. New York: McGraw-Hill, 2011. “Chop and Lift Q&A” (blog post). Charlie Weingroff, physical therapist, Sept. 18, 2010.